I cannot help but agree with Dr. Wes. I have tried for years to debate individuals involved in this ABMS medical mafia extortion scam to no avail. This includes a direct conversation with James Stockman, MD former President of the ABP for twenty years. Stockman always responded to critiques with the same circular reasoning that characterizes the raison d'etre of the ABMS. When queried, Dr. Stockman opined, as he surveyed his collection of antique cars housed in his elegant enormous garage, that had he not become a doctor he would have like to be a "used car salesman". Makes eminent sense. He and the ABP and ABMS have sold us a lemon. I hope the lawsuit against the abim will use these examples. If I were the medical schools that gave them their md’s, I would chastise them and ask them to return their diplomas due to them not following the Hippocratic oath. We became physicians to help and hot harm. Simply incredible the lengths these groups will go to in order to prevent transparency and perpetuate this monopoly. The greed and self-dealing is really something that has to stop. I cannot believe we have gotten to a point where medicine has become so fully under the thumb of so few self-interested individuals. 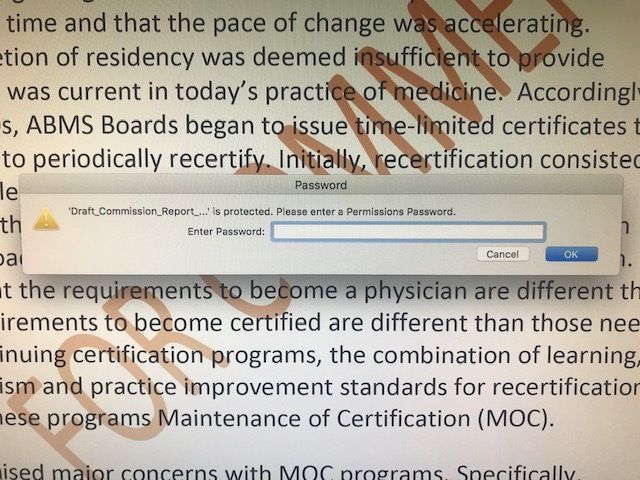 So by the Terms and Conditions anyone who registers to use the abim site is automatically agreeing to: changes they make from" time to time"
In 2014 PwC completed the take over of Booz & Co., "ratcheting up an aggressive move by large audit firms back into the lucrative consulting business more than 10 years after U.S. regulators tried to tease apart the two sectors." Can anyone solve this ABIM tax law riddle? In 2015 PwC moved into the ABIM offices, but never had to invest a dollar in Philadelphia real estate and pay the taxes to sustain emergency services, etc. Plus, get this, we are not sure if they PwC former Advisor is required to pay the local taxes. Can anyone guess where the PwC advisor working as "Chief Medical Officer" lives? Non-resident tax law for "Philadelphia workers"
"All paychecks issued by businesses with a pay date after June 30, 2018 must have Philadelphia City Wage Tax withheld at the new rates. Likewise, the City has lowered its Earnings Tax rate starting to July 1, 2018. The new Earnings Tax rates are 3.8809% (.038809) for residents and 3.4567% (.034567) for non-residents.Jun 21, 2018"